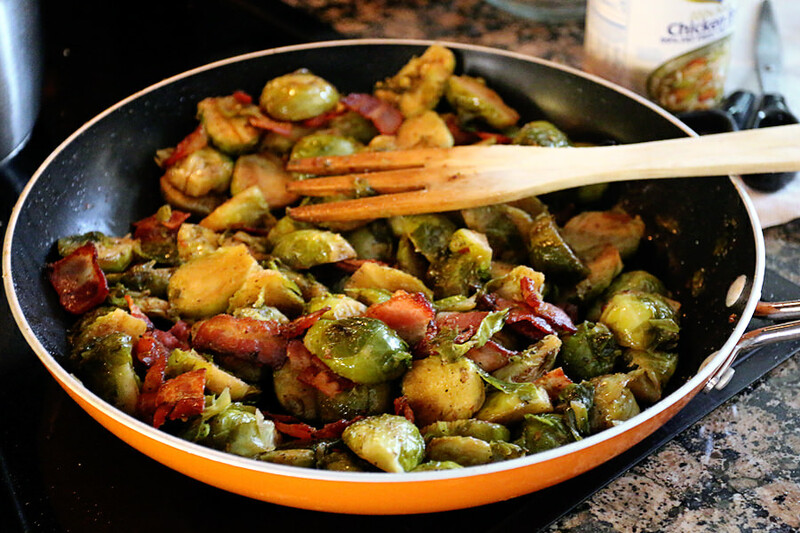 I’ve been making these garlic and bacon Brussels sprouts for my family for a long time and they always beg me to make more, so I’d say it’s one of their favorite keto recipes. Since Thanksgiving is coming up, I figured I’d share a recipe that is a guaranteed success for the holidays. Some onions, some garlic, and of course BACON! You always know it’s going to be good when there’s bacon involved. It’s become such a staple for my family during the holidays that they actually get mad at me when I don’t cook these Brussels sprouts. If I’m cooking for my family, then I will usually make about 2 pounds worth of Brussels sprouts, and double everything else in the recipe. They’re really easy to make, they’re really hard to screw up, and they’re extremely tasty. Yields 3 servings of Garlic and Bacon Brussels Sprouts. 1. 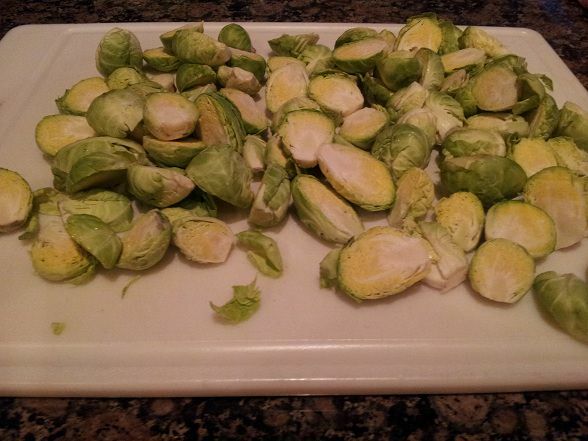 Half your Brussels sprouts by cutting down the white spine. Set these aside for later. 2. Finely dice the 1/3 of your onion. Set these aside with the Brussels sprouts. 3. Grab your 6-7 slices of bacon and cut them into squares. 4. Heat a pan to medium-high and add 1 Tbsp. of Olive Oil. 5. Right as the Olive Oil begins to smoke, add your bacon. 6. Let your bacon cook down until the fat has started to render. 7. 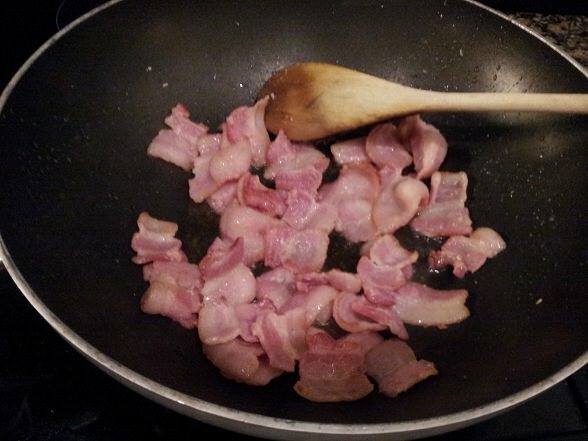 Remove the bacon and let them rest on a paper towel, try to keep as much fat in the pan as possible. 8. 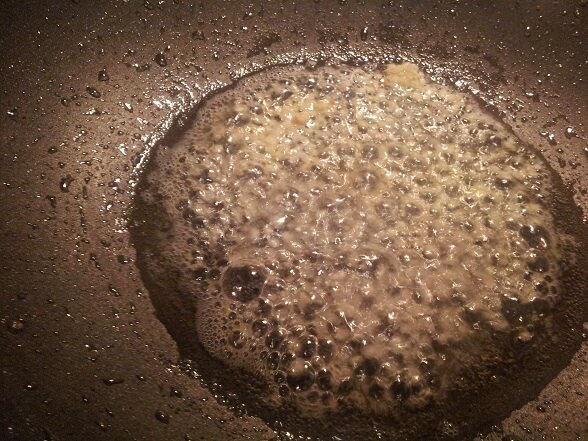 Add your butter to the oiled pan and let it start to brown. 9. Once your butter begins to brown, add the minced garlic. 10. Wait about 30 seconds and add your diced onion, let them cook until they are semi-translucent. 11. 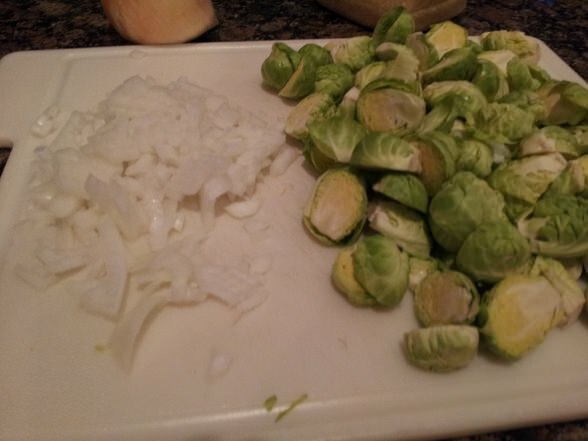 Add your Brussels sprouts in and add your salt & pepper. 12. 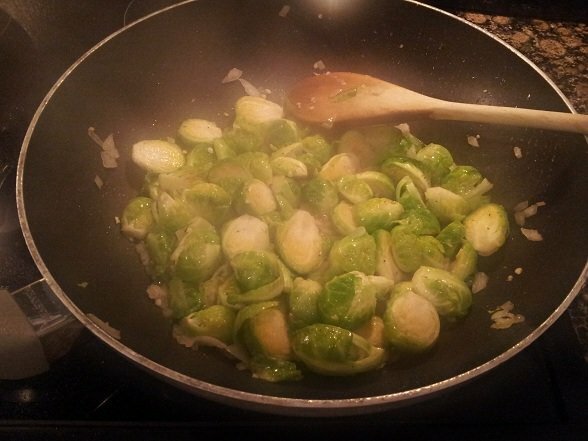 Mix well, so that every single Brussels sprout has a coating of fat. Let this cook for about 4-5 minutes, until they are starting to brown. 14. Let them absorb all the fats and chicken broth, stirring once 10 minutes in. 15. Check if the liquid has been absorbed by scraping a “hole” between the Brussels sprouts. 16. Add your bacon! Mix well, and serve hot. 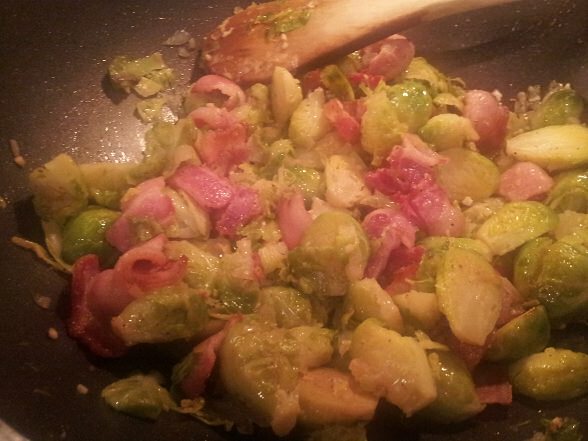 This makes a total of 3 servings of Garlic and Bacon Brussels Sprouts. Each serving comes out to be 254 Calories, 17.08g Fats, 10.12g Net Carbs, and 12.47g Protein. Halve your Brussels sprouts by cutting down the white spine. Set these aside for later. Finely dice the 1/3 of your onion. Set these aside with the Brussels sprouts. Grab your 6-7 slices of bacon and cut them into squares. Heat a pan to medium-high and add 1 Tbsp. of Olive Oil. Right as the Olive Oil begins to smoke, add your bacon. Let your bacon cook down until the fat has started to render. 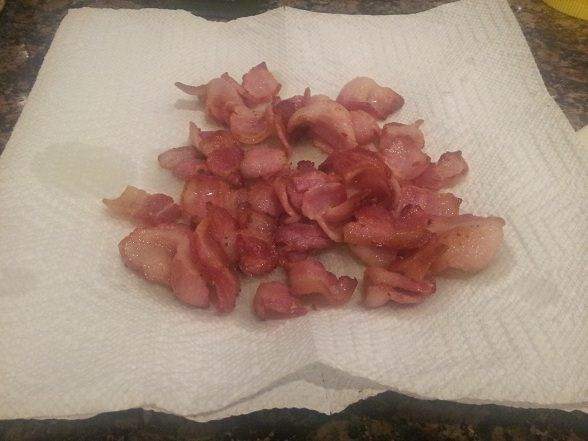 Remove the bacon and let them rest on a paper towel, try to keep as much fat in the pan as possible. 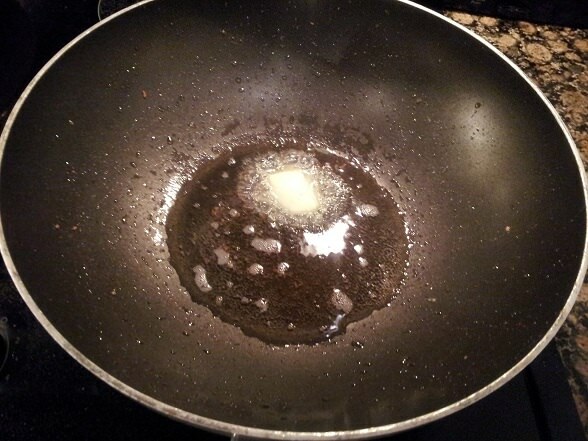 Add your butter to the oiled pan and let it start to brown. Once your butter begins to brown, add the minced garlic. 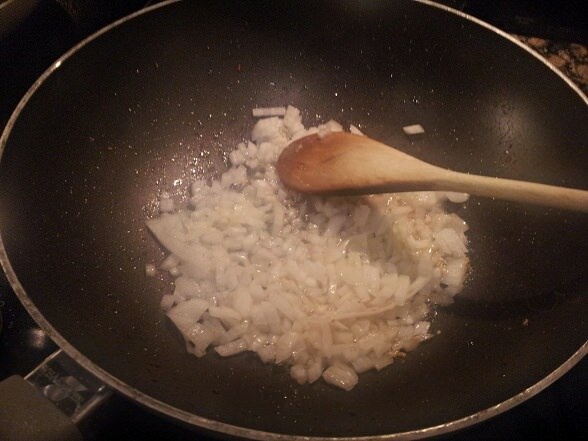 Wait about 30 seconds and add your diced onion, let them cook until they are semi-translucent. Add your Brussels sprouts in and add your salt & pepper. 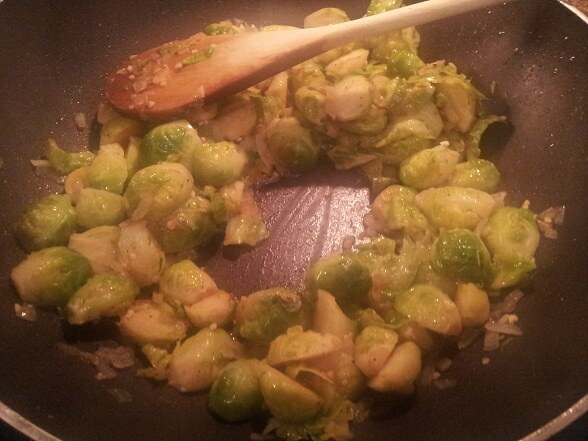 Mix well, so that every single Brussels sprout has a coating of fat. Let this cook for about 4-5 minutes, until they are starting to brown. Let them absorb all the fats and chicken broth, stirring once 10 minutes in. 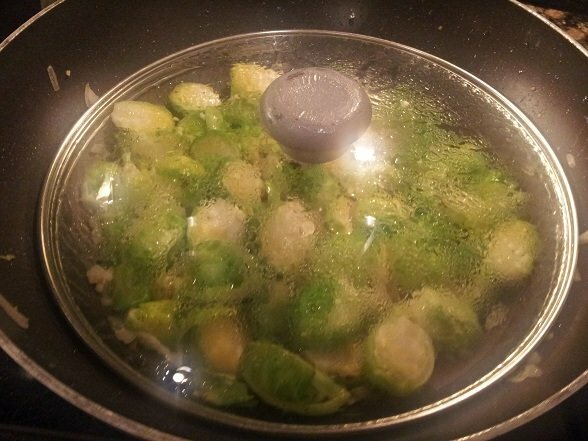 Check if the liquid has been absorbed by scraping a "hole" between the Brussels sprouts. Add your bacon! Mix well, and serve hot.